We came from all over the world to this three-sided, multimedia party known as the South By South West festivals, celebrating film, music and internet culture. But death cast a pall over its later days. The first fatalities to occur in SXSW's 27-year history -- two dead plus 23 people injured after a possibly drunk or drug-addled driver plowed into a festival crowd -- came after the Interactive segment finished, but as the film division stoically continued until yesterday and the music events still went on until today. Most of the film awards were announced at the weekend, on the whole going to well-deserved examples of that medium, from documentaries through narrative dramas to inventive animations. But in my view one supremely well-made short dramatic film ended up somewhat overlooked formally -- though it received fulsome praise from leading industry lights such as director Gus Van Sant ("a great piece of work, I want everyone to see it"), actor/director Ed Harris ("Acted superbly, shot beautifully, and directed with confidence and subtlety"), and actor/screenwriter Matt Damon ("a stellar piece of work"). Maybe -- I hazard to guess -- One Armed Man, a directorial debut by Tim Guinee, was just a little too grim for attendees to vote for en masse in the suddenly deflated mood of Austin. (An additional sad grimness might also derive from the fact that this intense depiction lasting 27 minutes of a horrific death -- set in 1920s Texas -- was executive produced by the late Philip Seymour Hoffman, to whom the movie is now respectfully and lovingly dedicated). It is pretty much an actors' film, probably no surprise since director Guinee is best known as an actor himself. He's become familiar on TV for his roles in episodic thrillers like NBC's Revolution and Showtime's Homeland (where he plays a CIA operational supervisor, displaying tightly concentrated but calm competence, leavened with all the professional, even anxious wariness that would be necessary). His One Armed Man is based on a Horton Foote one-act play - again something that's not especially surprising since Guinee is also known for having married a daughter of the Texan (well, also American, international and universal) dramatist. That's not the actress, Hallie Foote, but the writer, Daisy Foote. 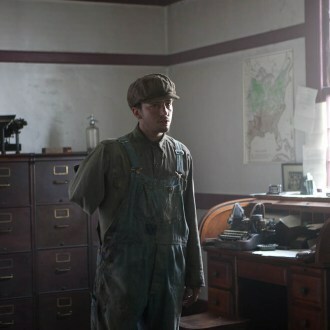 The compelling drive of the film concerns the unshakable insistence of a young man (played in spooky unhinged fashion by John Magaro, pictured above) who has recently had his arm ripped off by a cotton gin. And that machinery's inescapable noise repeatedly invades our senses as we watch him press his case with the business-owner (played by Charles Haid). His case -- horribly unanswerable -- is that the boss should give him back his arm. "I've a strong sense that self-justification may well be just about the worst sin there is," Guinee told me as we spoke in one of Austin's few quiet nooks during "South-By." And it's certainly true that the owner, referred to throughout by his initials C.W., spends much of his fraught encounter with the injured man trying to justify himself -- while also pontificating about the virtues of American business. "Horton gets compared a lot to Chekhov, and with good reason -- mainly for his enormous subtlety with sub-text," Guinee reflected. "I've acted in several of Horton's pieces on stage and on film, and once you think you've understood the meaning of a character's lines, you'll then uncover a whole new layer, and then even more." The drama's denouement, almost inevitable in its explosion of violence, nevertheless left the Austin audience stunned and -- more than a touch -- ethically wrongfooted. One of "The Rules" in this medium full of rules (mostly proclaimed, of course, only to be broken) is, the director ruefully recalled being told: "If you're gonna make a short, do NOT make a period short." Guinee has in fact paid meticulous attention to the artifacts and the mood of an American rural industry on the verge of the Great Depression's catastrophe ... and at the same time his small movie speaks loudly to our modern world and our moral debasements with a powerful timelessness. Read more of David Tereshchuk's media industry insights at his regular column, The Media Beat, with accompanying video and audio. Listen also to The Media Beat podcasts on demand from Connecticut's NPR station WHDD, and at iTunes.